We love local businesses, and they love us! 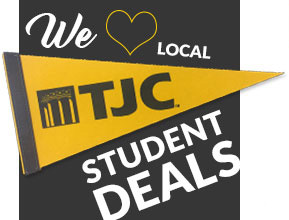 Present your student ID at these local businesses for a discount. Do you have a business you would like listed here? Email us! Eagle Auto Glass 5% off order "non-dealer parts"
Tyler Rock Gym Day passes for $10 and equipment rentals for $5 weekdays from 9 a.m.-3 p.m.
Tyler Escape $5 off of "One Way Out"
Offers may not be combined with any other coupons, discounts, offers, or promotions. Other restrictions may apply.